WHY BUY FROM IN 2 KNIVES? Here at In 2 Knives, we share your passion for knives. 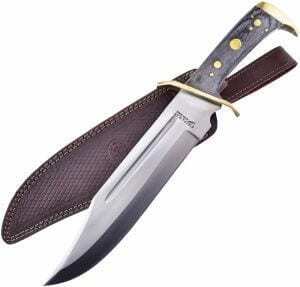 We are the number one place to buy knives online in Australia and have quite literally everything including hunting knives in Australia, Tramontina knives, Bowie knives online and we are the perfect place to buy a fishing knife in Australia. All of our knives look fantastic and not only that, they are incredibly practical. 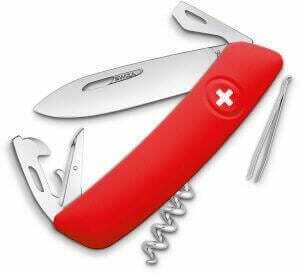 We provide top quality knives and knife accessories such as leather knife pouches at extremely competitive prices. We know that you can purchase inferior quality knives from almost anywhere in the world but we are different, we sell knives online in Australia because we are an Australian online knife shop. We ARE Australians and we are based right here in Australia. You will find our selection of Fixed Blade knives one of the best in Australia and the same goes for our Pocket Knife selection in Australia. As we have many years’ experience, we will be able to advise on the best knives for you. We pride ourselves that we are knife enthusiasts and not just sellers. This means that the information we tell you comes from the heart and is not an easy sales pitch from an untrained shop assistant. We are a family owned and run business and our reputation is hugely important to us so we pride ourselves on our levels of service, not to mention our knowledge. As you can see from our website, we have a truly fantastic range of knives that we can ship all across Australia and to New Zealand. 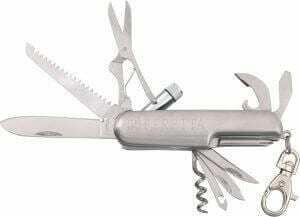 If you are looking to buy knives online in Australia then you have come to the right place. We ensure that we ONLY sell the highest quality knives and knife related products. We believe that if we start stocking lower quality products, we will be letting our customers down as when you shop with us you can be confident that you will get quality products. 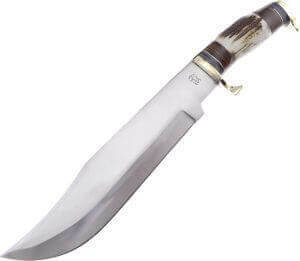 You can see on our website that we have an extensive selection of hunting knives online, fishing knives in Australia, Tramontina knives, and if you are looking for a pocket knife in Australia we have those too, along with knife accessories. We stock all the top brands so we know that there is something out there for you! In addition to knives, we also stock a fantastic selection of accessories including leather knife pouches, sharpeners, sheaths, leather belts and other related products and knife accessories. Like our name suggests, we are very ‘in 2 knives’. Our team are always available during standard office hours 5 days a week to provide advice to assist you with your choice. We are ‘hands on’ and all orders are processed from our store here in Australia (No Drop Shipping). We also make our site as secure as possible. 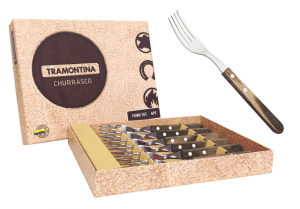 If you would like more information about how to buy knives online in Australia, specific knives such as Tramontina knives, Bowie knives, pocket knives and hunting knives then we would like to invite you to get in touch. You can call us on 0487 394 163, email on info@in2knives.com or alternatively, you can contact us via our website. We look forward to hearing from you. Frost Cutlery Sunrise Bowie 16.5" overall. 6 Pce Fork Set Jumbo Handles Stainless steel View product. Legends Leather knife pouch brown with Buckle closure View product. 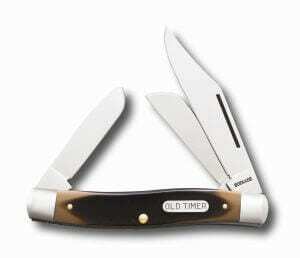 Schrade Old Timer 'Senior' Stockman 8OT 4" closed. View product. 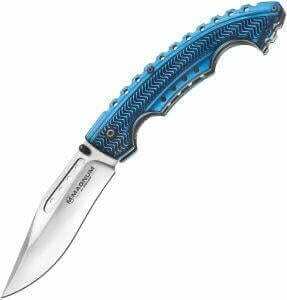 Boker Magnum 'Blue Bowie' Linerlock 4.88" closed. 3.88" View product. 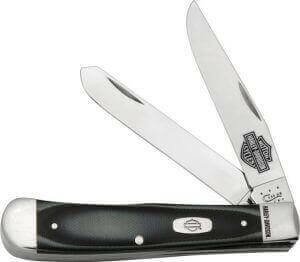 Trapper Harley-Davidson 10254 SS pattern. 4 1/8" closed. View product. 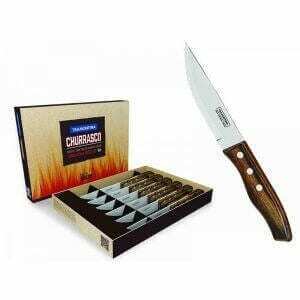 Rio Grande Jumbo Steak Knives 5" Stainless steel View product. 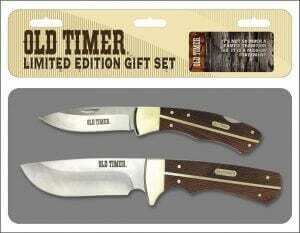 Old Timer Family Tradition gift tin Satin finish View product. Features interchangeable 6" and 9" 420 J2 stainless View product. Pakistan Trophy Stag. 16" overall. 11" satin finish View product. We carefully select ONLY the highest quality knives and knife related products. We are passionate about knives and also passionate about maintaining a great reputation. You will find a great and very wide variety of knife brands and knife brand accessories within our online shop. There is definitely something for everyone here. If you are ever looking for a specific knife and can’t find it, please use our site search or contact us. We offer a wide range of Knives, Sharpeners, Pouches/Sheaths, Leather Belts and other related products and knife accessories. Like our name suggests, we are very ‘in 2 knives’. Our team are always available during standard office hours 5 days a week to provide advice to assist you with your choice. We are ‘hands on’ and all orders are processed from our store here in Australia (No Drop Shipping). We also make our site as secure as possible. How awesome are knives! We luv them! Here’s a quick bit of info about our site: Delivery is fast! Our site is very secure. We are based here in Australia and we DON’T Drop Ship. If you are based in Australia, there are no postage fees. If you are based in another country, our shipping fees are very affordable. Happy Shopping!